Project Description: In preparation for construction of a new State prison and State psychiatric hospital, Junction City undertook a system-wide upgrade to their water supply system. A key element of the upgrade was the DWPS. Prior to DWPS the City’s water supply operated with wells pumping directly to the distribution grid and which filled a relatively small 150,000 gallon elevated tank. With the upgrade the wells now pump to the City’s 1.25 MG and 2.2 MG ground storage tanks which supply DWPS. 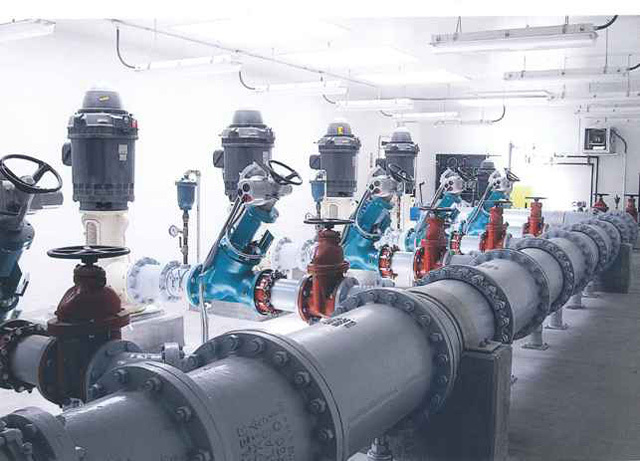 With four 100 HP vertical turbine pumps, plus a spare, operating in parallel DWPS provides a peak pump station capacity above 8,000 GPM pumping into the distribution grid and supplying the City’s new 300,000 gallon elevated reservoirs.